It might be difficult to believe – in this capitalist driven society we live in – but investment doesn’t have to equal cold hard cash. No, it doesn’t. It doesn’t have to cost a penny to indulge in some self-love. 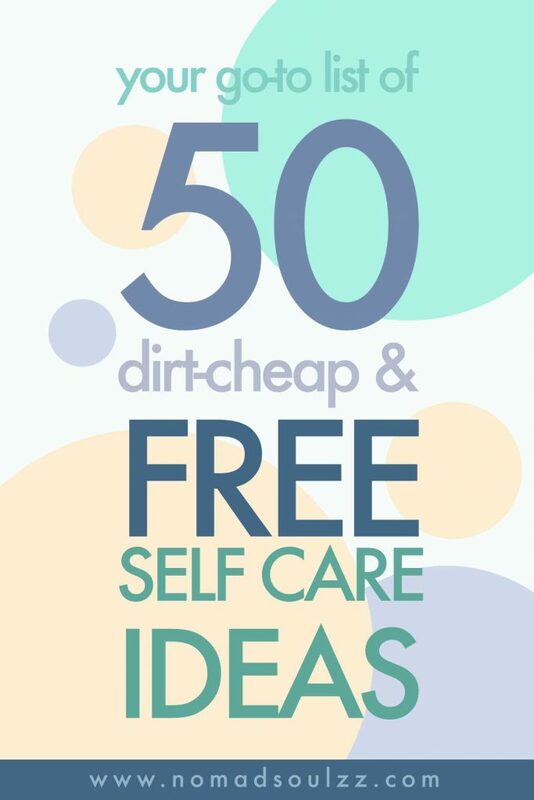 Free self-care here we come! Take a breath, sounds good right? Investment can also be love, dedication and time. Three things we personally believe everyone should allow themselves to invest in, for themselves. To ultimately make the world a brighter and lighter place to live in, for you and everyone in it. 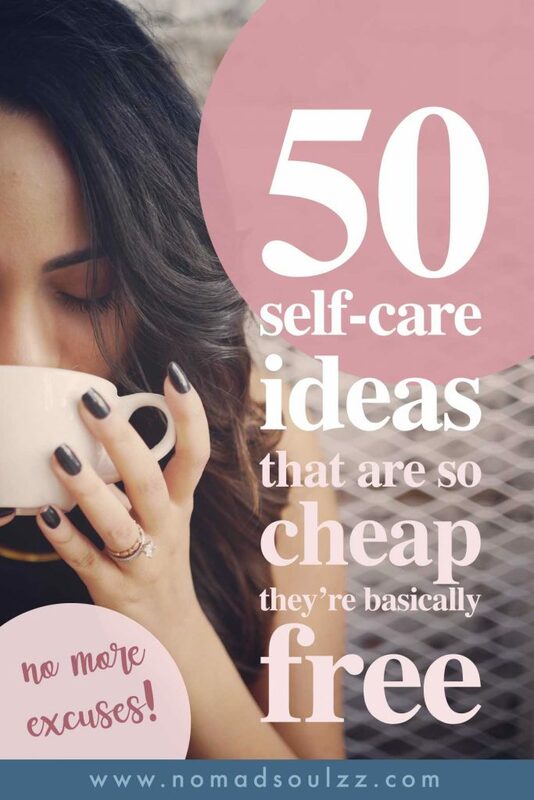 Free self-care ideas, free of overrated costs, rather valued by love, dedication and time. So if you’re ready, so are we. You can do this. And you TOTALLY DESERVE this too. If you struggle with setting aside time to do self-care, most probably you’re procrastinating. You’re finding 100 other things you should rather do or you’re allowing yourself to be distracted from self-love time. Stop self-sabotaging yourself now and check out this post where dive deeper into why you procrastinate and what you can do to help yourself become more assertive. That being said, we also want to address that we know how tough financial stress can be. 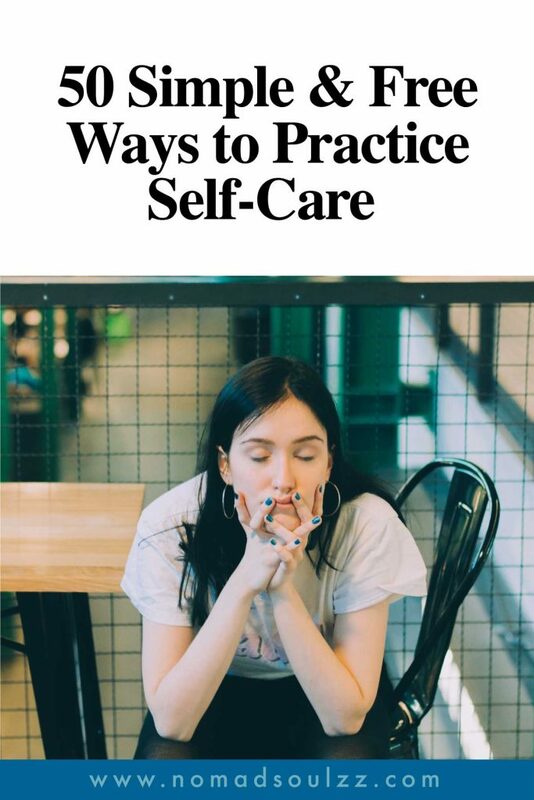 It can totally take you off track of any kind of self-care. When in those moments, self-nourishment is actually so important. 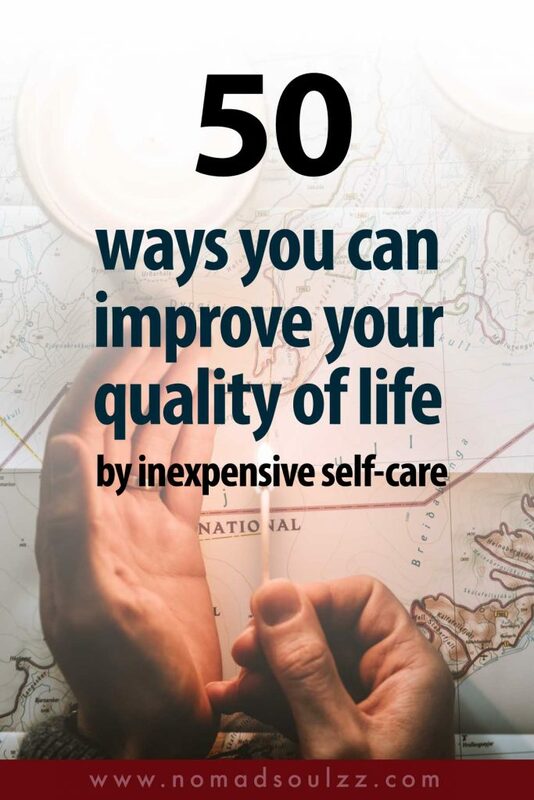 Instead of telling you to go get a massage or ‘treat’ yourself to a takeaway healthy sandwich, we want to prove to you how self-care can be just as valuable without spending a dollar. 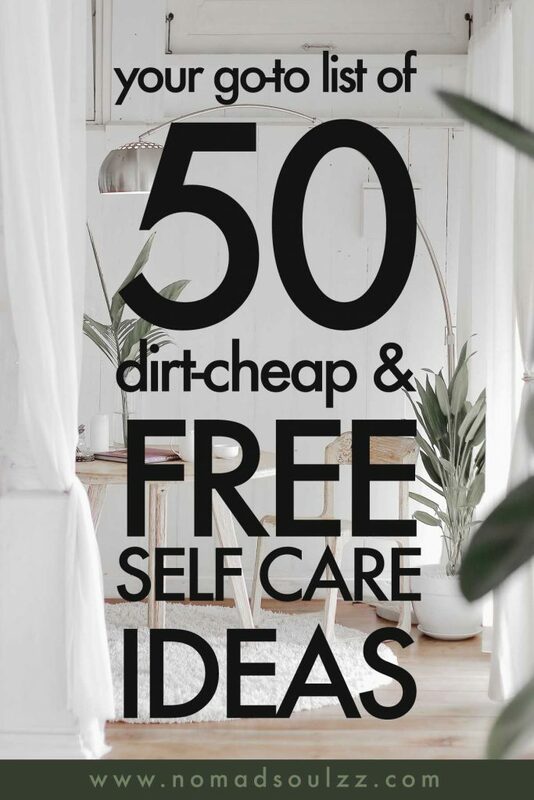 This list of free/dirt-cheap self-care ideas is great for anyone. 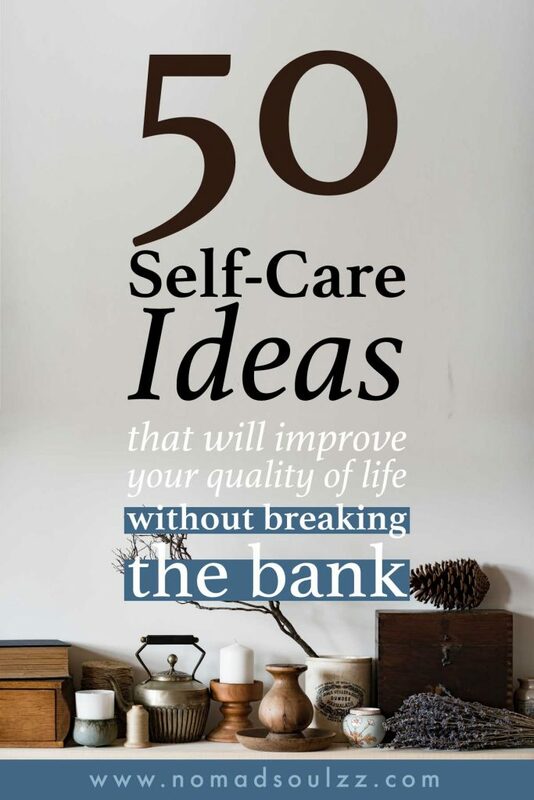 Whether you are struggling financially or you are just looking for simple yet valuable self-care ideas, this is for you. 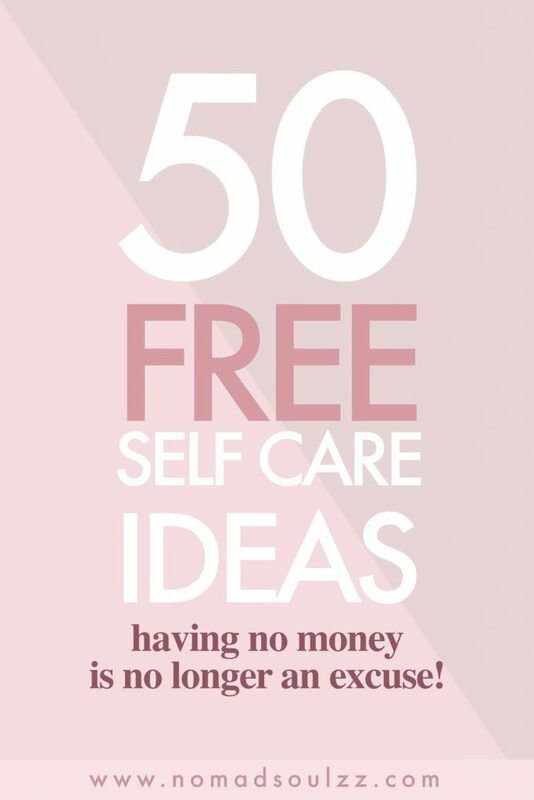 Having no money can’t be an excuse anymore for some self-care time! So pull up those self-care socks and just do it. We just want to give you a fair warning before you start browsing through the list below. A fair warning that it’s not going to be packed with magical paid products that are now magically available for free. Also, you might be surprised that some items are even on the list. 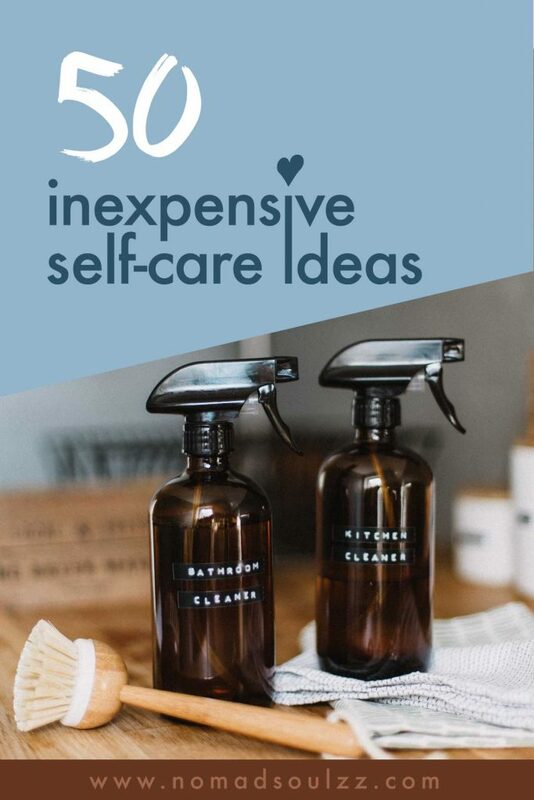 Such as clean up a room, like how is that self-care? Well, here at Nomadsoulzz self-care is not just the obvious. It’s the mindful approach you can put into anything. Besides that, cleaning up a room is in a way like cleaning your mind. Outer order, creating inner peace. The result of cleaning the room, the bit where we talk about inner peace, that is what we consider a great gift towards ones self-care. Are you picking up what we are putting down here? Approach practical activities mindful, allow all your senses to be involved in what you are doing and you’ll undoubtedly experience change because you’re changing the way you approach it. So besides the physical, mental and spiritual elements of self-care we also welcome the intellectual, social, emotional and yes, practical element of self-care. If you’d like to read more about our take on this, check out one of our most popular posts to this day: the seven pillars of serenity. The seven dimensions of self-care. You won’t regret it, neither would you regret one of these other life choices! 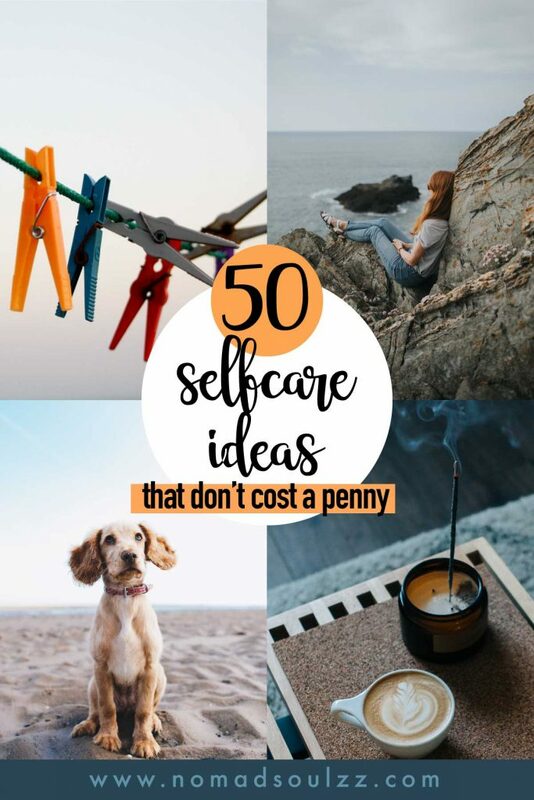 So yeah, now it’s really time to pull up those self-care socks and start snuggling in these simple, effective and yet dirt-cheap or even free self-care activities. Yasssss! Feel the feet touch the ground and the blood running through your body, smell and feel the air, see your surrounding and hear the sounds. Take it all in and let it recharge you. As if the walk is a reset to your daily activities. If you’re looking for instant gratification is there anything better than a quick tidying up session? Gosh, the satisfaction after you cleaned up your space. Heaven! Another one of those extreme mindful activities. It requires more energy than a quick sweep, but the result pays off. Not only in a materialistic sense, also in your mind. And every next time you come across that drawer, or thing you cleaned you’ll smile a little extra. Win! Play a game with (your) kids. The contagious laugh of kids, and their bubbling excitement… gotta love it 🙂 Embrace your inner child and go along with their joyful approach to life. Mindfully drink a refreshing glass of water. Cuddle with dogs, cats, bunnies, fishes (maybe just look at them). Water the plants and say some kind words to them whilst you’re at it. Youtube is your friend here. Enough friendly people out there showing and explaining to you how to do self-massage. Yum! Follow a free online yoga class. 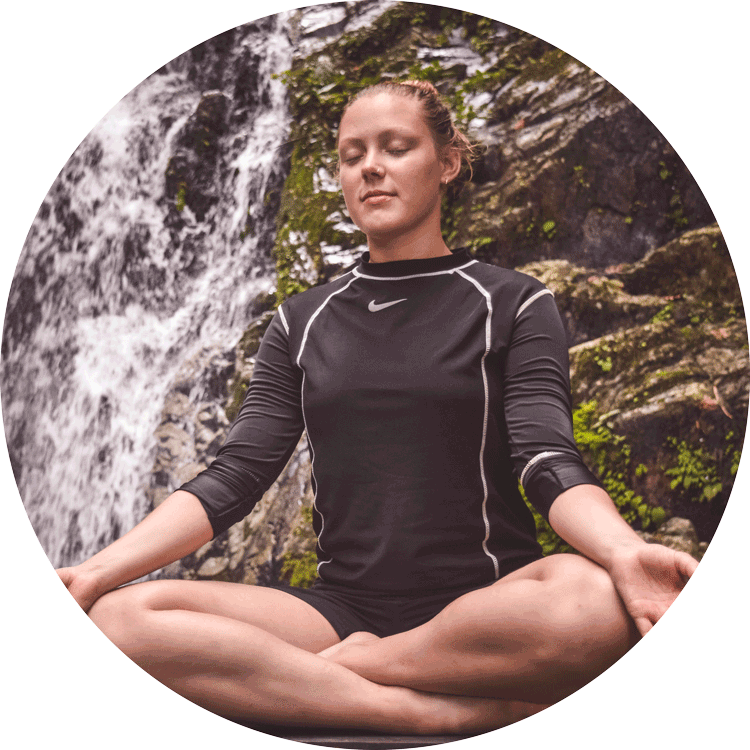 We recommend and will continue to recommend Yoga by Adriene, she offers a wide variety of sequences and her guidance throughout them is fantastic. You can find her channel on Youtube. Put away any distraction, find a nice comfortable spot and allow yourself to reconnect in the now and observe the mind as it is. Letting thoughts come and go like clouds in the sky. 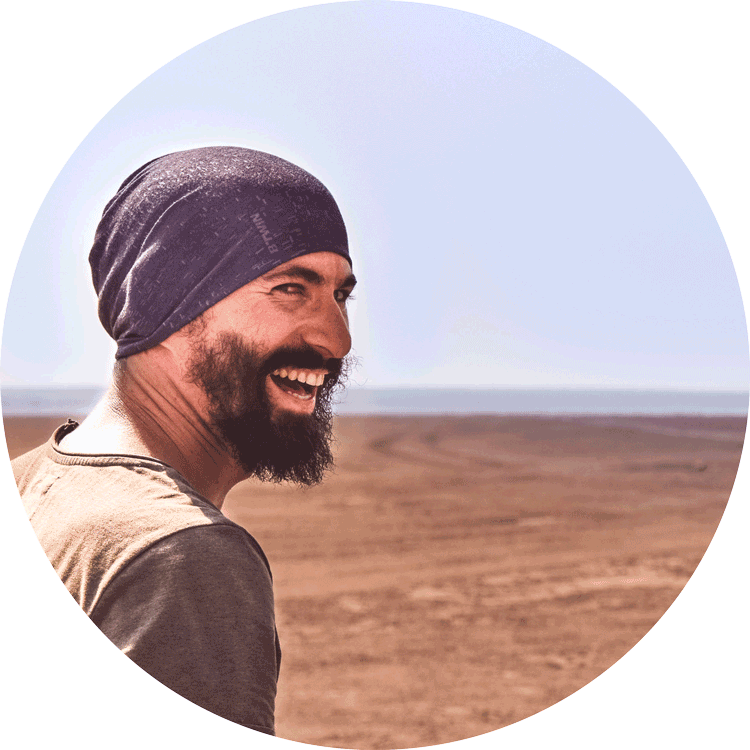 I (and hundreds of thousand other people) use the app insight timer for both complete silent as guided meditations. The app is a great way to track your meditation sessions. We also love their bells that indicate the ending of a session (a wide range of Tibetan singing bowls) as it’s the closest it gets to the real thing. If you are totally new to meditation we recommend the app headspace. They break it down in small steps and explain several techniques along the way. You’ve got this! Have your feet (or hands) soak in some warm water. An inexpensive, but nonetheless a delightful form of attention towards the extremities of our body. They deserve that love as they work so much for us on a daily basis. Dim the lights and listen to some music without distraction. When we say dim the lights, it’s for your eyes to truly calm down. In our current house, we don’t have any dimmers installed on the lights so we just light up a candle or two and that’s enough to light up the room. This is great self-care activity as part of your night-routine. Prepare yourself and enjoy a loving soothing cup of tea (or coffee). 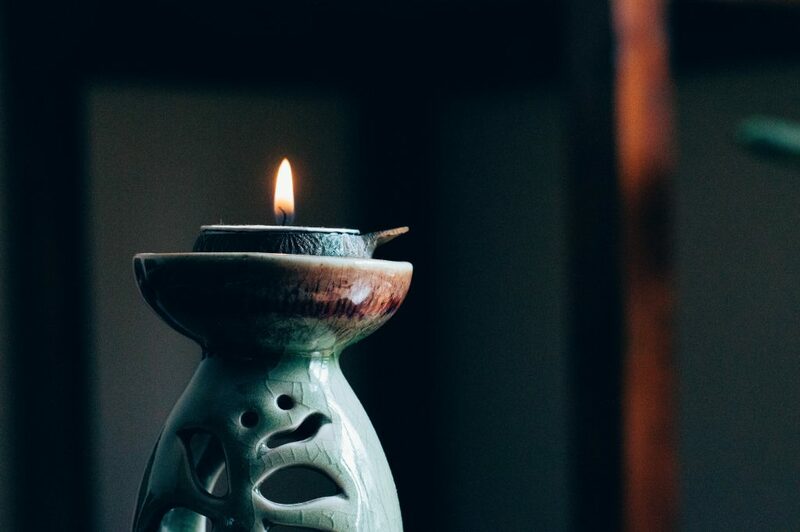 Light up some incense and enjoy how the scent spreads throughout your house. Confession: we do this every single day. So freaking amazing, we have no idea where we would be without it. After some quick research, our love for it has been confirmed even more as it apparently promotes better sleep, reduces stress and anxiety, enhances focus and concentration ánd reduces pain (by inhaling natural herbs). So if you weren’t convinced yet, here you go! Works like a charm, every single time! Follow a free tutorial online. This is to stimulate yourself intellectually, to surprise yourself with what you all can do. Follow a tutorial on how to edit a picture, or how to say hello in a different language, or how to fold clothes in one second. Allow yourself to be imperfect, clumsy and laugh about it. The magic of a candle. Personally speaking, gazing into the flickering flames ignites a peaceful feeling like nothing else. Our motto: never underestimate a good book. Set a goal you want to achieve in the coming year. It creates a feeling of purpose and it ignites inspiration to get going. Having a goal helps you stay focused and it’s a great reminder to keep going. Be aware to not only set business-related goals, also personal and social goals. Balance is key! Call or meet up with a friend. This is so much fun and will not only make them feel better, so will you. If you struggle with some social anxiety doing something like this it is not that easy. But you know what, everyone appreciates a compliment or can feel the love. It feels damn awesome to give compliments and it has this way of boosting your own confidence! Collect the wins! Mindset is everything. Just like we discussed earlier, approaching a very practical issue mindfully is half the work. Practicing positive affirmations is the training of the mind. Teaching it to think in a certain way (in a positive, encouraging way) will make your life, in general, more positive. You will start attracting the things you want, things will flow. We’ve written quite some articles about positive affirmations so that a good place to start for some more info. Go through some old pictures and rejoice the beautiful memories. Sigh, the good ol’ days. Draw, paint, doodle, photograph, sing, dance, knit, play an instrument, design, upgrade an old piece of clothing… Whatever it takes to spark your creative soul! Throw away or donate 5 things you no longer need or use. Less materialistic attachments create a calmer you. One of the big reason why the Minimalism movement is so famous and successful is that it has a positive effect. If you can donate stuff, you will also make someone else happy. If it’s still in good condition, why not try to sell it? For some more motivation check out our list of motivating minimalism quotes. Have a stroll through a bookstore or library. There is something so mystically peaceful about strolling through a bookstore or library. I believe that one of the reasons has to be that there is so much information in one place. Also, I tend to think of all the writers that have worked years to create a book… and all that passion, love and knowledge of all those writers and creators come together in a place like that. I leave a place like that with a smile on my face, and I encourage you to try the same. Do some vacation research and make a bucket list of places where you want to go one day. Sketch out a personal self-care routine for yourself. Oh yes, baby! Make a small checklist of self-care activities you love to do. Make it as your heart desires and schedule the time when you’ll be checking them off, one at a time. Here an example of some things we do on our Self-Care Sundays. Watch a (free) documentary online. Youtube, Vimeo or even just regular television (does anyone still watch that nowadays?). Inform yourself on a subject you don’t know much about. Mindblow yourself, so much fun really! Ain’t cost a thing. Skip mindless scrolling through social media and close the curtains half an hour sooner. Our night time rest is of great importance for countless things, so be your own mama and help yourself by going to bed on time. Vibrations, over-lit screen, notifications… All distractions from the things that truly matter. A proper self-care activity is allowing yourself to let go of that distraction and to enjoy life in that very given moment. You can do this, and you’ll love it! Nomadsoulzz’ digital detox: 21 Practical things you can do to let your buzzing phone not buzz your peace of mind. Who said self-care had to be difficult? Have a walk, sit on a bench and take in the nature surrounding you. What a gift. Love my friend, only love. Open up towards someone you trust and ask advice for something you’re struggling with. Let us pop your bubble. You don’t need to figure it all out by yourself ánd, it’s ok to ask for help. Opening up can help you discover issues you need to deal with, having an objective view can help clarify things. Take a deep breath, and give it a shot. Take a good shower and fully moisturize your body afterward. I use olive oil, so really, you don’t need fancy expensive creams, just saying. Look up life quotes you want to live by. Contemplate about them, write them down and hang them in a spot where you can remind yourself of them often. Nomadsoulzz’ Wall of Growth: a collection of all our positive words, quotes, affirmations! Do/organize something unexpected & special for your partner, close family or best friends. Some wonderful social self-care. A massage, bake a cake, write a letter why they mean so much to you, lay out a treasure hunt, make a memory jar etc. Do something personal, something money can’t buy. Do more research on a topic you have interest in. Self-care is also taking care of your interests. Inspiring yourself on a more intellectual layer. Learning new skills! Hello, inspiration! How is this budget friendly? By limiting yourself to what you have in the house. Cut out pictures or words from an old magazine, write down quotes (use different colors to get creative), maybe print out pictures from the web. Collect all those songs you love. Those songs that make you feel alive every time you listen to them. You won’t regret it. Phoe, maybe not an easy one but if you’re looking for ways to grow personally, letting go of grudges and focusing on forgiveness is a very good step in the right direction. Switch the focus from maybe blaming others to understanding and accepting yourself. Indulge in your favorite movie or tv show. Who cares if you’ve seen it already. If it made you happy or it will make you happy, do it! Enjoy some time off the radar, diving deep into that crime that needs to be solved (Sherlock, anyone?). Just as much as rolling around in your pj’s is self-care, dressing up is too! When I use to go to college, (I did a bachelor in dance), I used to be dressed in leotards or very loose, danceable, very pajama-like clothes the whole day. When I did decide to dress up I would feel like Beyonce on her way to the Grammy’s, like a boss. So yea, just going all out when it comes to dressing yourself is SO worth it. And more self-care than you imagine. So you might not be interested in a full blast yoga class, but a couple of stretches don’t do harm now to they? If you work a lot behind a desk or don’t get moving that much on a regular basis doing some stretches is something you’re body will be grateful for. Enjoy the sunrise or sunset. Mother Nature’s gifts are truly boundless. Enjoying what she has to offer during those golden hours blisses me out every time more and more. Nothing beats a proper sunrise or sunset. Totally budget friendly as most art galleries don’t ask for an entrance fee. And it’s self-care as you’re opening up to other ways of expression. Allowing yourself to interpret ánd appreciate art. On a side note, many museums also offer free entrance on certain days. So just have a quick internet search to find that out and enjoy even more free art! Just like giving a compliment to a stranger, offering your help to someone or a friend is a great form of service. Help a mom with her baby stroller, open a door, pick up a scarf someone drops on the floor, help your friend move or paint their house etc. Life is something we share together, so why not help each other whilst we’re at it? Yet another way to indulge in something that inspires our mind and soul! So let’s go! We’re so happy & proud that this list is here for you for you to enjoy! 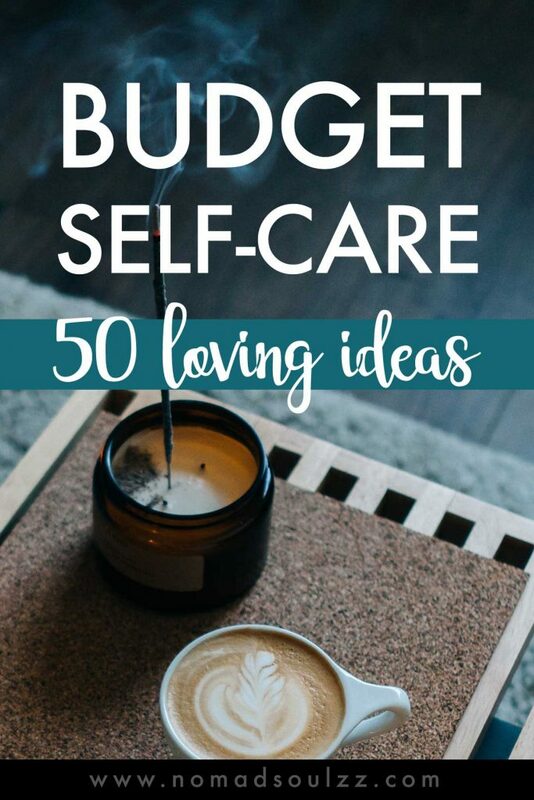 We hope it’s inspired you to do something for yourself and that you realize you don’t need much budget to indulge in some self-care activities.